S I G N & D I G I T A L G R A P H I C S • June 2018 • 37 He notes that when approaching any job, the best thing a customer can do is be transparent with their fabric, ink, and print providers. "Most of the time, com- plications arise when there is a lack of communication between the customer and their providers. For example, if the fabric provider does not know that the customer intends to make double-sided flags that will be outdoor long-term, they may not suggest a fabric at the right weight or construction to ensure optimal print through or with the correct finish to withstand the elements." Weiss adds that dye sub transfer gives users the best most vivid imagery. "You can read dye sub verbiage up close and understand what it says. However, recently, direct dye sub and other direct methods are becoming much closer in output ability and since the industry feels that it's quicker to print direct, machine manufacturers play on that and continue to design machines that are better and better. The print provider must again decide what is important to them and if they have the expertise to simply print direct or have workers that can properly transfer the print. For some direct print works best for their customers application." Lowe reports that dye sub and direct digital printing have similar end results that the average consumer won't even notice. "With digital printing technology improving all the time, I find that each year there are fewer and fewer companies that do screen printing. Our company still offers screen printing and is the only way I'm aware of to print on Sunbrella fabric which is popular for small town light pole banners. We continue to offer appliqué using 200 denier nylon fabric as well. This process is still desired by some markets, such as school gymnasium and parade banners as well as large arena ceiling banners. There's still something about that handcrafted look that appeals to some users." 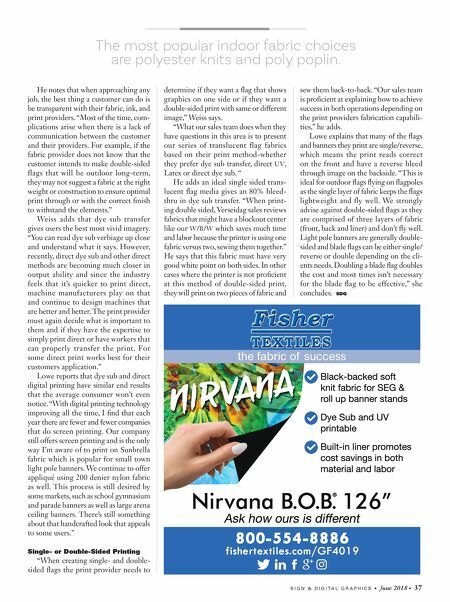 Single- or Double-Sided Printing "When creating single- and double- sided flags the print provider needs to determine if they want a flag that shows graphics on one side or if they want a double-sided print with same or different image," Weiss says. 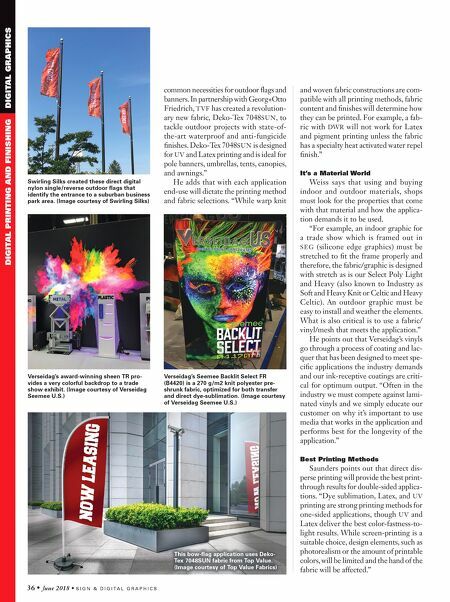 "What our sales team does when they have questions in this area is to present our series of translucent flag fabrics based on their print method-whether they prefer dye sub transfer, direct UV, Latex or direct dye sub. " He adds an ideal single sided trans- lucent flag media gives an 80% bleed- thru in dye sub transfer. "When print- ing double sided, Verseidag sales reviews fabrics that might have a blockout center like our W/B/W which saves much time and labor because the printer is using one fabric versus two, sewing them together." He says that this fabric must have very good white point on both sides. In other cases where the printer is not proficient at this method of double-sided print, they will print on two pieces of fabric and sew them back-to-back. "Our sales team is proficient at explaining how to achieve success in both operations depending on the print providers fabrication capabili- ties," he adds. Lowe explains that many of the flags and banners they print are single/reverse, which means the print reads correct on the front and have a reverse bleed through image on the backside. "This is ideal for outdoor flags flying on flagpoles as the single layer of fabric keeps the flags lightweight and fly well. We strongly advise against double-sided flags as they are comprised of three layers of fabric (front, back and liner) and don't fly well. Light pole banners are generally double- sided and blade flags can be either single/ reverse or double depending on the cli- ents needs. Doubling a blade flag doubles the cost and most times isn't necessary for the blade flag to be effective," she concludes. SDG The most popular indoor fabric choices are polyester knits and poly poplin.